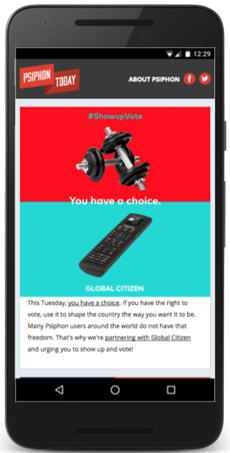 Ahead of the 2016 United States elections, Global Citizen launched its “Show Up and Vote” campaign to encourage young Americans to vote. In addition to an online campaign, represented by the hashtag #ShowupVote, Global Citizen hosted a series of events and concerts with high-profile artists. showing a selection of images and a brief paragraph explaining the importance of the project. In the final two days ahead of the election, the promotion was changed to ensure maximum visibility of the #ShowupVote content. As election day ended, Psiphon followed this up by taking users to Global Citizen’s live coverage, giving them a chance to follow the results as they came in. Overall, Global Citizen’s content was seen 1.5 million times in the US. In highly censored regions, during national and international news events, it is common for the use of circumvention tools to increase as people attempt to acquire news from a variety of sources. The U.S. election was no exception. There was an increase in use of Psiphon in many countries, including from Vietnam, Russia, Iran, Kazakhstan, Saudi Arabia, and the United Arab Emirates, during the lead-up to and on the day of the election. The increase was most notable from China, where live-streaming coverage of the U.S. election was banned and TV networks were told to avoid “excessive” coverage of the event.